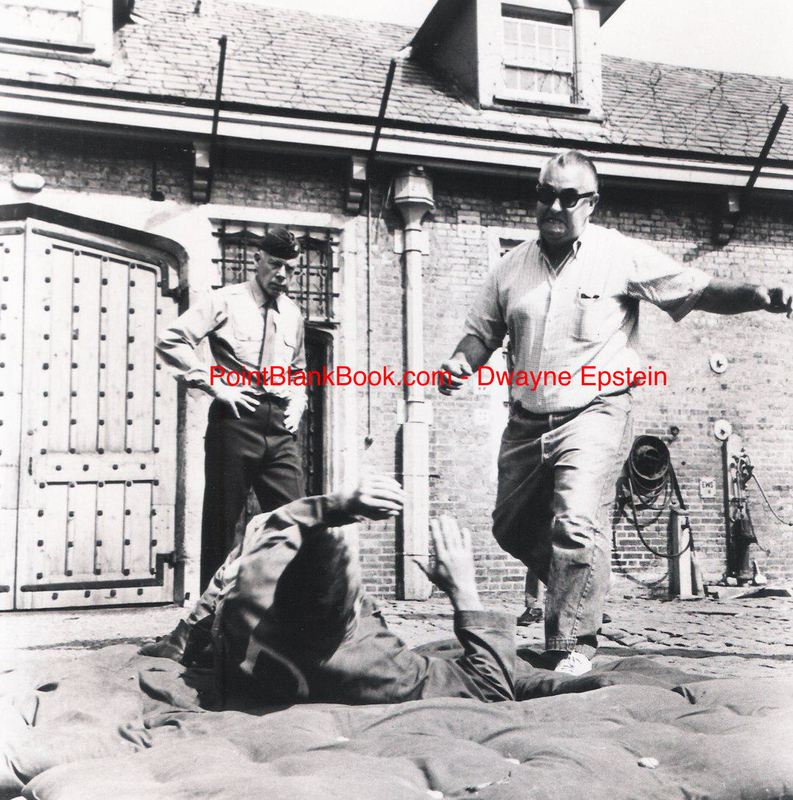 The Dirty Dozen Offscreen: Director Robert Aldrich shows Lee Marvin how to kick John Cassavetes when he’s down. Making The Dirty Dozen (1967) in England took intense concentration on the part of all concerned but The Dirty Dozen offscreen was something else. Of course, after a day’s work several of the pubs in London took their usual dents from Marvin & company, as detailed in Lee Marvin Point Blank. On the job, however, was another story entirely. The above image is a case in point. Director Robert Aldrich (right) is not giving his opinion of the films of John Cassavetes (center). He’s showing Lee Marvin how he wants to see Cassavetes kicked when he’s down during the opening scene of the film. Note the padded mattress used for rehearsal but NOT seen in the onscreen version . With apologies to Monty Python, Marvin took such important knowledge to heart as he demonstrates his prowess with a “pointed stick” …. The Dirty Dozen offscreen: The bemused victim is producer Ken Hyman (right) while fellow Lee Marvin crony Bob Phillips (center) vocalizes instructions. By the way, the photo above was graciously contributed by Phillips who was a former college football star, US Marine and Chicago police detective. He was exactly the kind of guy Lee Marvin would want to pal around with, which is exactly what he did. The interview I conducted with Phillips remains one of my favorites as he contributed some of my favorite stories to the text of my book. He and Marvin spent a good part of their time wreaking havoc and having fun on one movie set or another. Amazingly, despite such bizarre shennigans as the hysterical pub brawl in London and the infamous female reporter incident (gotta read the book! ), both men were always ready and able to work the next day. The old saying is true: They just don’t make’em like that any more! This entry was posted in Blog and tagged 1967, Bob Phillips, England, John Cassavetes, Ken Hyman, Lee Marvin, Lee Marvin Point Blank, London, Monty Python, Robert Aldrich, The Dirty Dozen by Dwayne Epstein. Bookmark the permalink.